With its front roller system, the DS321 easily enables you to sand flush in even the smallest of spaces or tightest of corners. The DS321 is a lightweight and compact 6AMP belt sander, which, while lacking the power for large jobs, is ideal for those all-important finishing touches. It also features a retractable multi-function handle, which adds to its ease of use. 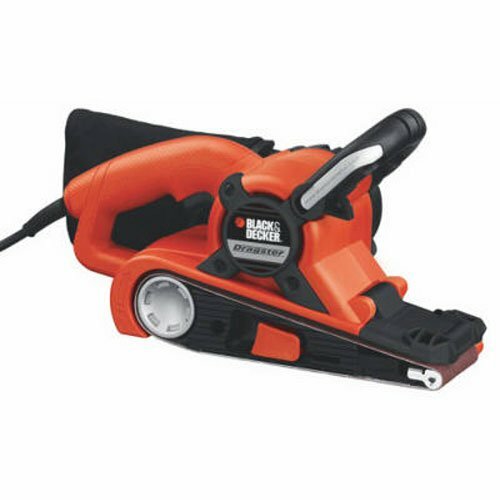 Ask any professional, and they will usually tell you that Black & Decker tools lack the power and quality required for full-on professional trades. However, the occasional hobbyist, or someone whose interest is detail finishing rather than woodwork, would be ideally served by the DS321. A lightweight, compact sander, the DS321 offers good basic functionality, and is designed to be easy and comfortable for a novice user attempting small projects. The front roller is what stands out about this model. This useful little feature allows the user to reach even the tightest corners with ease. Of course, the fact that the handle is multi-position also helps when working in small spaces. The DS321 provides good power for its price, and is larger than many equivalent sanders. It is also superior to many sanders when it comes to achieving a genuinely flush finish. A good buy for those who will be focusing on smaller pieces and detail work. When used for these purposes, the DS321 certainly packs a good punch for the price. Those looking to tackle larger projects, or who are professional carpenters, would, however, be wasting their money purchasing this sander, as it is not designed for that level of workload.